Here’s something we didn’t expect to be bringing you deep into a Tuesday night… the official cover image of Dannii Minogue’s forthcoming hits compile ‘This Is It : The Very Best’. The new collection, to be released later this month, features 21 tracks on the CD and 24 tracks on the digital edition, spanning 23 years of Dannii’s extraordinary career. The Australian-only release also contains a brand new track called ”Cos You’re Beautiful’, co-written with X Factor UK contestant Ruth Lorenzo, who also lends her talents on backing vocals. 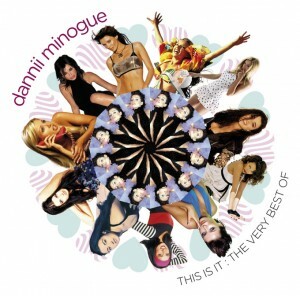 Dannii Minogue’s ‘This Is It : The Very Best Of’ drops at retail on Friday August 23. No CD/DVD edition as far as we’re aware. Just the disc/digital releases. Any word on a cd/dvd edition? Not what I was expecting but it’s very Dannii. The This Is It picture captures your eye. Still bit confused by the tracklisting. This Is The Way & Get Into You not on the Physical CD yet I Don’t Wanna Take This Pain & Show You The Way are but were much lesser hits or barely charted here. Shame Get Into You gets ignored. still great to have an updated Hits with Cos You’re Beautiful.